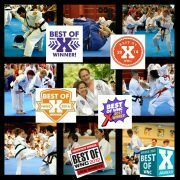 Asheville Sun Soo Martial Arts Offers End of School Year Special for Kids! Asheville Sun Soo Martial Arts is excited to offer a fantastic special opportunity for any pre-college student (ages 3-18) who would like to begin a martial arts practice before the end of the school year! This offer makes their first month of practice and their uniform available at an extreme discount to help new students get started in their practice. This offer is made available through current students who wish to distribute this offer to friends and associates with whom they’d like to practice. See us at the desk for access to the special offer and for more information! https://www.martialartsasheville.com/wp-content/uploads/2018/05/20180518_134102.jpg 1280 720 Ms Smith https://www.martialartsasheville.com/wp-content/uploads/2017/07/Logo-Dark-Background-300x198.png Ms Smith2018-05-22 18:45:592018-05-22 18:50:40Asheville Sun Soo Martial Arts Offers End of School Year Special for Kids! For this month only, in recognition of the holiday season, Asheville Sun Soo Martial Arts is offering $100 off the first month – for new students who enroll during the month of December 2017! This offer is open to the public. So feel free to share with your friends and family members and remind them to mention this holiday offer when they call or come in the studio. In addition, please remember that we have a totally separate, special holiday gift idea and offer – available to EXISTING SUN SOO STUDENTS AND THEIR FAMILIES. For more information about this holiday season’s coolest gift offer, please call us or come and see us at the front desk! We’ll help you give the best gift of the 2017 season! https://www.martialartsasheville.com/wp-content/uploads/2017/12/asheville-sun-soo-martial-arts-holiday-gift-certificate-graphic-2017.jpg 1044 1037 Ms Smith https://www.martialartsasheville.com/wp-content/uploads/2017/07/Logo-Dark-Background-300x198.png Ms Smith2017-12-13 13:52:332017-12-13 13:52:33Two Holiday Special Opportunities! Q: What is the Philosophy of Tae Kwon Do? A: When we learn philosophy from a book, we tend to quickly forget it because it is not related to our actual lives. However, since Taekwondo is connected with every physical movement of our lives, we may never forget its philosophy. Since we experience life through the movements of daily living and we experience Taekwondo through its movements, we begin to understand the philosophy of Taekwondo by practicing Taekwondo and relating it to our daily movements. 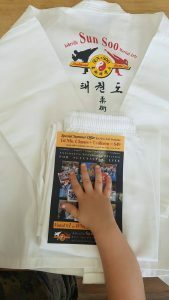 To fully appreciate and understand the philosophy or spirit of Taekwondo, it is important to know something of Korean history, since the traditional values of the Korean people are an integral part of the philosophy of Taekwondo. Although not based on any one religion, the philosophy of Taekwondo was influenced by the many religious beliefs of the Korean (Han) people. The philosophy of Taekwondo has evolved over time in the same way that its physical aspects have evolved. The original philosophical aspects were based on the need for survival and defense of the homeland. Ancient Koreans, in learning to deal with natural disasters and the hardships of life, relied spiritually on the movements of nature’s power, such as heaven, rain, cloud, sun, moon, trees, rocks, etc., for their consolation. As the tribal and agricultural community of the Korean people became established, so did their spirit of national unity. This developed into the principle of Seon (impeccable virtuousness), which became the basis of Korean philosophical thoughts. The idea of Seon is a very profound philosophy, it is the core of Oriental thoughts. In Seon, movements embody the spirit physically and the spirit is the inner working of the movements. Taekwondo philosophy is based upon the beliefs that Han people developed throughout their history. It is related to the ancient principles of Hongik-Ingan and Jaese-Ihwa, and to the spirit of Hwarangdo. During the development of the Korean nation, particularly during the Three Kingdoms era, Taekwondo’s predecessor, Taekkyon, developed into a systematized martial art. The Korean warriors (Hwarang) of the Silla Kingdom adopted Seon as their martial spirit. Based on this, they professed loyalty to their country and filial piety, and believed in the virtues of courage and of having a strong ethical code. 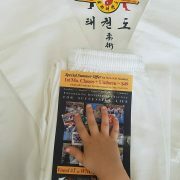 Taekwondo philosophy developed from the traditional national thought of the Korean (Han) people. In the myth of Korean foundation, in the early age, Hwan-Wung, the son of Heaven established a nation called Baedal (earliest name of Korea). He then announced the purpose of the national foundation as Jaese-Ihwa (educate with the reason of heaven) and Hongik-Ingan (universal welfare of mankind). According to Korean legend, Tangun, the legendary founder of the Korean nation, advocated the idealism of Hongik-Ingan, Jaese-Ihwa, or Hwarangdo spirit. Hongik-Ingan and Jaese-Ihwa were a fundamental thought of Han people. Hongik-Ingan and Jaese-Ihwa appear clearly in the myth of Korea’s foundation. According to it, “In the early age, Hwan-Wung, the son of Heaven established a nation called Baedal (earliest name of Korea), and then announced the purpose of the national foundation as Jaese-Ihwa and Hongik-Ingan.” With time, these ideas developed into the Hwarangdo spirit and the Taekwondo philosophy of today. These thoughts became the basis for the Korean traditional national philosophy, and later, the basis of Taekwondo philosophy. Hongik-Ingan (universal benefits of humanism) means universal welfare of mankind. Taekwondo also embodies the idea of Hongik-Ingan since its purpose is to suppress fighting and induce peace. Jaese-Ihwa means that the world is educated in accordance with the reason of heaven. Since Taekwondo is characterized by the trinity of body, mind, it relates to Jaese-Ihwa since we may be educated in accordance with the reason of heaven through correct training in Taekwondo. During the Three Kingdoms period, Koreans were having to defend themselves from foreign aggressions from China and Japan. Due to this, the kingdoms tried to consolidate national unity, stressing the spirit of national defense among the people. Buddhism and Confucianism were widely practiced. The idealism of Hongik-Ingan, represented by the philosophy of Seon, was expanded by the Hwarang warriors with the integration of Buddhist and Confucian ideas into the Hwarangdo spirit. The Hwarangdo spirit is characterized by the three virtues of loyalty, filial piety, and trust, and three virtuous conducts of modesty, frugality, and restraint. Hongik-Ingan stresses respect for all human beings. The Korean people throughout the Koryo and Chosun periods were taught in their daily life to respect their superiors and treat their inferiors kindly. During this time, scholars were expressing various philosophical theories. One of the scholars, Great Scholar Yi Toe Gye, favored the theory of dualistic spiritual energy, which is represented by the four moral minds of benevolence, righteousness, propriety, and wisdom and the seven sentiments of joy, anger, sorrow, pleasure, love, vice, and avarice. Another scholar, Great Scholar Yi Yul-Kok, said in his writings, “I endeavored incessantly to achieve self-restraint until I could reach a realm of a saintly life,” “I do what is to be done with all sincerity,” and “Cultivation of the mind and learning should be continued without slowing down the tempo.” These sayings partly reflect the spirit of Taekwondo. One of the most significant ideals of the time was that of Chon-do (doing the right thing or following the right way), which has become an integral part of Taekwondo philosophy. The Hwarangdo spirit was based on the idea of Seon along with the integration of Confucianism, Buddhism, and Taoism. It contained the three virtues, the five principles of the world; and the three virtuous conducts. Chung (loyalty): refers to loyalty to the nation. Hyo (Filial piety): means the filial piety to the parents. Shin (Trust): means to have trust among human beings. Sa-kun-lee-chung: means to follow a nation and a king with loyalty. Sa-chin-lee-hyo: means to respect parents with filial piety. Kyo-u-lee-shin: means to make friends with trust. Lim-cheon-mu-t’wi: means to not withdraw on the battle field. Sal-saeng-yu-taek: means to not take another life, unless an unavoidable situation requires it. Modesty: means the virtue to know courteous refusal. That is, it refers to services done for society without personal interests or gains. Also, it refers to the idea of contributing to social development rather than to that of an individual. Frugality: means not to waste. If we live with the abundant materials without extravagance or waste, we will not suffer in difficult times. Also, such frugality generates the ability to help needy people in society. Restraint: refers to self-denial. It means to win over one’s self or ego. Through restraint, people do not fight each other, rather, they live together in harmony. The philosophy of Taekwondo also is related to the principles of Sam Jae and of Eum/Yang. Sam Jae (Three Elements) refers to Cheon (the Heaven), Ji (the Earth), and In (the Man) and the principles uniting them. In oriental philosophy, these principles explain the changes of everything in the world. In the orient, Sam Jae is central principle that explains the changes of everything in the world. Sam Jae and the changes of Eum/Yang constitute the Eight Trigrams for Divination in the Book of Changes The principle of Eum/Yang maintains that everything has an good and bad side. Taegeuk (the Great Absolute) represents the ultimate claim that Eum/Yang are actually one and the same. At the core of this philosophy is the concept of duality in nature. Duality refers to the interaction of opposing forces, the Eum/Yang. The principle of Eum (the negative or darkness) and Yang (the positive or the brightness) maintains that everything has an opposite side and that the two work in harmony with opposing forces distributed equally. If one force dominates, the result is discord. For example, to defend against an aggressive hard attack, one should use a yielding soft defense to bring the situation into harmony. 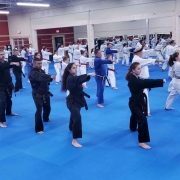 Taekwondo students learn to coordinate their actions and reactions with the forces of nature so they can overcome anything they encounter in life. By centering oneself and balancing the dual forces, students may begin to achieve the true goal of the aspiration to and application of perfection. Taekwondo is defined and the way of kicking and punching. Students begin Taekwondo training for various reasons, such as fitness, weight loss, discipline, and self-defense. Many stop their training when they think they have achieved their reason for initially beginning the training and others stop before ever reaching this point. If students continue training until the reach the “do” phase of Taekwondo training, then their initial reason for beginning the training is irrelevant. At this point, they continue training because the basic principles of Taekwondo have become an integral part of their lives. Through kicking and punching, they have achieved the way. In today’s society, there are relatively fewer chances to encounter a life-threatening situation. To spend several years of your life practicing Taekwondo would seem a high price to pay for the chance to defend yourself in the not-so-likely event of a deadly attack. Therefore, the spiritual part of Taekwondo is what should motivate everyone to practice Taekwondo. Today’s Taekwondo Philosophy is best summarized by the tenets of Taekwondo that are recited at the beginning of most Taekwondo classes. Most students recite the tenets by rote without thinking about their meanings. If some thought is given to the tenets while reciting them, students would find many correlations between each tenet and what they have learned during their training and how it has affected their lives. Taekwondo philosophy is not preached at each class, instead, it is something the subtlety affects the thoughts and behavior of students over time and makes them better members of society. https://www.martialartsasheville.com/wp-content/uploads/2017/07/Logo-Dark-Background-300x198.png 0 0 Master Morris https://www.martialartsasheville.com/wp-content/uploads/2017/07/Logo-Dark-Background-300x198.png Master Morris2010-12-10 21:29:442010-12-10 21:29:44Q: What is the Philosophy of Tae Kwon Do? Q: Why Do Martial Artists Bow All the Time? As you may know, bowing is common in the culture of an authentic martial arts practice. Practitioners bow when they first enter the space of practice. They bow to each other upon greeting and parting. They bow to the flags, one representing their country of residence and the other representing the country of their art’s origin. Students bow to their instructors and instructors, in turn bow back to their students. They bow again upon stepping onto and then again upon exiting the official practice area (“dojang” for Korean arts, dojo for Japanese arts, etc.,.). Then during practice, they bow again, to each new partner they engage with for part of class. They seem to be bowing all the time! So what’s with all the bowing? On the surface, it would appear to be a simple mechanic of etiquette, – a gesture of respect – that seemingly occurs at every turn in a martial arts setting. Sometimes, the gesture is misinterpreted – or even actually misused – as some sort of a power trip intended to create an atmosphere of servitude. The true purpose however, runs deep and is powerfully effective in its original intent. The true purpose of bowing is to facilitate appreciation – in the form of both 1) “dignified respect” and 2) “gratitude”. The idea is to remind ourselves of all that is around us that is worthy of respect and for which we are fortunate – and therefore thankful – to be able to experience. Through engaging the body and dedicating a moment for punctuation, the act of bowing helps the martial artist to “land” all of these moments of awareness. In accumulating these many moments of appreciation, the martial artist experiences a profound sense of fulfillment and well-being and sense of connection to everything. This sense of well-being is nurturing and strengthening and creates an inner stability and positive perspective that dwarfs the negativity in the world. So how will your life be different if you practice appreciating throughout the day? And while bowing is not part of our western culture, you may substitute whatever mechanic or gesture you are comfortable with. A gentle nod, a knowing smile, a touch to the shoulder or an extra moment of eye-contact are just a few of the ways we can punctuate a moment of appreciation in our everyday lives. https://www.martialartsasheville.com/wp-content/uploads/2017/07/Logo-Dark-Background-300x198.png 0 0 sunsoo https://www.martialartsasheville.com/wp-content/uploads/2017/07/Logo-Dark-Background-300x198.png sunsoo2010-12-09 18:27:502010-12-09 18:27:50Q: Why Do Martial Artists Bow All the Time? Q: Which direction should I face while I adjust my uniform or belt? A: Great question! Adjusting one’s uniform should be performed “turned away” from the direction that the class is facing. It is out of respect for the instructor, the other students and the practice space (dojang) itself. In the context of “being excellent”, the idea is that we always present ourselves as best as we can in any given moment! https://www.martialartsasheville.com/wp-content/uploads/2017/07/Logo-Dark-Background-300x198.png 0 0 sunsoo https://www.martialartsasheville.com/wp-content/uploads/2017/07/Logo-Dark-Background-300x198.png sunsoo2010-10-10 20:26:022010-10-10 20:26:02Q: Which direction should I face while I adjust my uniform or belt? Q: So, Who Is Higher Ranking? A: The question came up recently after class about who is higher ranking than whom and we decided to clarify. So, why is rank even important? Firstly, we want to make the point that higher rank does not necessarily mean better or superior! It means that this particular person has put in the time and effort in the Sun Soo system to move up the ranks sooner. In our Traditional Tae Kwon Do class, we line up according to rank with the highest ranking person standing to the right of the lower ranking students. We also ask lower ranking students to seek out higher ranking students to answer any clarifying questions. We also ask higher ranking students to remain humble and not use their rank to control or humiliate lower ranking students. Higher ranking than you (as indicated by belt color). If two or more students are the same belt rank, the higher ranking student is the one who tested into that rank first in the Sun Soo system. If two or more students are the same belt rank and tested at the same time, the higher ranking student is the one who began attending classes first. Please let us know if you have any other questions about rank. https://www.martialartsasheville.com/wp-content/uploads/2017/07/Logo-Dark-Background-300x198.png 0 0 sunsoo https://www.martialartsasheville.com/wp-content/uploads/2017/07/Logo-Dark-Background-300x198.png sunsoo2010-10-02 21:26:242010-10-02 21:26:24Q: So, Who Is Higher Ranking? Q: What do we say at the end of class? A: We say: “Sugu-hashi som nida” which means “thank you for the class” in Korean. https://www.martialartsasheville.com/wp-content/uploads/2017/07/Logo-Dark-Background-300x198.png 0 0 sunsoo https://www.martialartsasheville.com/wp-content/uploads/2017/07/Logo-Dark-Background-300x198.png sunsoo2010-08-20 19:56:412010-08-20 19:56:41Q: What do we say at the end of class?